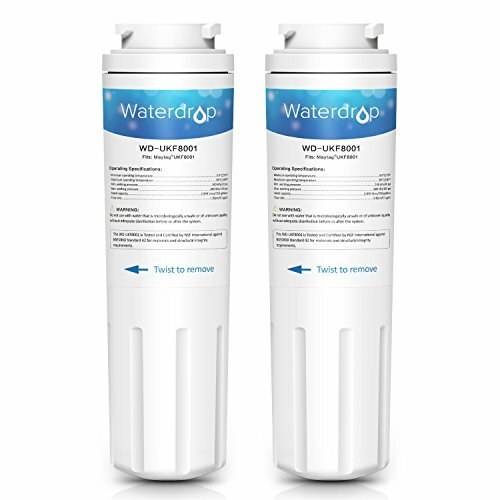 Waterdrop’s NSF-certified UKF8001 replacement refrigerator water filter provides you and your loved ones with an easy and affordable approach to clean and fresh water. It transforms your way of hydration and contributes to an ideal lifestyle. It is compatible with Maytag UKF8001. To achieve optimal performance, it is recommended to replace the filter every 6 months or 750 gallons, whichever comes first. The filters are tested and certified by NSF International against NSF/ANSI 42 for material safety and structural integrity. They are certified to reduce chlorine, taste and odor. We focus on quality and service. We are ISO9001 certified and we comply with strict manufacturing standards to offer quality products. As a customer-oriented business, we will always stand by to answer your question and satisfy your needs promptly.